Trucking industry rates have gone up 10 to 20 percent over the last year or so, with rate increases occurring nearly every quarter. The reasons range from ELD fallout and delays to too few drivers and leaving empty space in trailers. 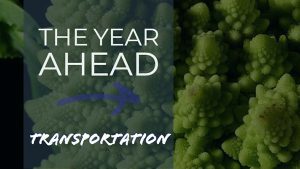 Mary-Scott DeMarchis, sales manager at FresH2O Growers in Stevensburg, VA, says transport costs are certainly up, but so are the inputs—which of course will lead to higher pricing. Amy Childress, vice president of marketing and planning for cargo solutions at Emerson in Jupiter, FL, agrees. “The rising costs are going to hit the consumer eventually,” she says, which is why it’s so important to monitor shipping and avoids all manner of complications. Emerson’s Locus Traxx tracking devices can help with scheduling issues, delays, and unexpected problems during transport. “If it’s tracked and monitored, the margin for error is less,” Childress says. To cap an eventful 2018, Blueprints asked produce suppliers and other experts to look into their crystal balls and weigh in on the trends and issues that will be most prominent in 2019. Karen Raugust is a freelance writer who covers business topics ranging from retailing to the food industry.